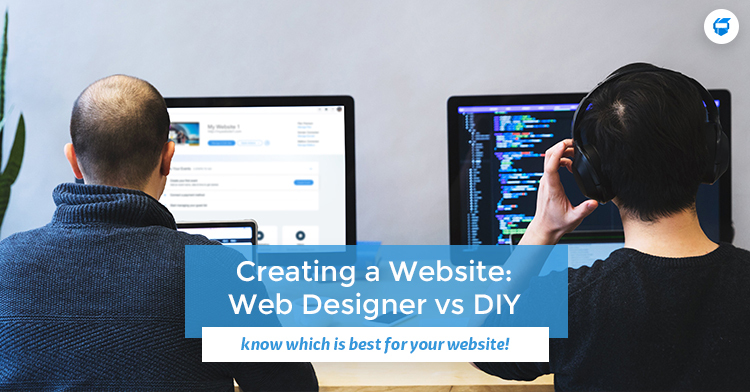 Creating a Website: Web Designer or DIY? | WAZILE Inc. Web designer or DIY? In today’s time, websites are easier to create or build with the availability of so many website builders such as Wix, WordPress, Weebly, Voog, Shopify, Magneto, Joomla, Drupal and many more. But do you know the difference if you should hire a web designer/developer or just do it yourself? We all know that websites are already a necessity when it comes to businesses and independent individuals that wants to send their readers their offers or ideas in just one click. Here are some pros and cons that we’ll break down for you. Web designers/developers have everything that they need to build an amazing website. All you have to do is to collaborate with them. They already have software that they purchased and downloaded to their computer, they can create graphics, illustrations and photos to make your site look more professional. Comparing on understanding the website builder, Web Designers/Developers don’t need to do that as it will be simple for them to do anything since they are doing it professionally. Web designers know the full potential of the builders, best practices and how to optimize it. Most website builders have readymade themes and all you have to do is select what you want. But what if you want something customized? It will take you so much time on doing that. When hiring a web designer, you can just tell them how you want your website’s design to look like and they’ll do it all for you by just presenting your idea to them. They have different ideas and can help you customize your website’s design and layout. Web designers and developers can also help you with your site’s domain and web hosting, which can help your website appear on the internet. They can help you with your domain, e-mail and web hosting. Web designer/developers can also help you optimize the speed of your website for your visitors. Having web designers/developers to create your website can give you a professional look in the final product. They are professionals and have worked on different types of website designs and more. They know what’s new, what’s updated, and what people tend to search for these days. Web designers and developers are up to date with the latest in technology and especially in security. Aside from designing and developing your website, they can also keep your sites protected and secure from malware and malicious data that could harm your website. Web designers/developers do make the job easier for you and will require less time on your part. It would usually take 4-12 weeks on creating your website, and that depends on the type of project you are aiming for. This is because they are going to build you a professional website that includes multiple revisions, edits and more. Some companies take longer due to having multiple projects in hand, while other companies can go as fast as 2 weeks. The key is to find a good web designer or company that can deliver fast and quality results! A lot of confidential information will be asked by the professionals when it comes to designing your website. This is because you are collaborating with them and making them a part of you team. Private details of your business are put at stake to an extent. It could lead to trouble once your information is misused. There’s another option for this where you, as a client, can ask the web design company how they handle confidentiality, then you will be able to decide. If that’s not enough for you, you can make the company agree to a confidentiality agreement or a Non-Disclosure Agreement (NDA). Web designers and developers tend to be expensive. We can estimate that hiring a developer is at around $500 (PHP26,000) to $5,000 (PHP264,000). It may cost a lot but shall be worth it just as long as you find a trusted and effective company to do the job for you. Building your own website can save you hundreds and thousands. There are website builders that has different offers when it comes to domain, e-mail and web hosting. There is no pressure when it comes to deadlines or having to send people your business information. You can work at anytime that you want, one page at a time, without rushing into anything. If you enjoy the entire process of creating a website and being satisfied with your work, then congratulations! You have finished building your own website! After all the hard work and time that you have gave in building your website, you will feel that sweet sense of accomplishment. Some DIYs doesn’t look professional since they tend to use templates and themes that are given free and available by the website builder. What’s worse is having your website look like other websites and the only difference is your brand and logo! Tricky codes are everywhere. If the codes are not right, expect results that could affect your website’s functionality. You will be stuck on creating your website instead of having to work on the other parts or departments of your business. If you want to have a professional website on the web, it will take you a while to build it. This might also be a bit challenge especially when you have an 8-hour job to work on. Having your website secured and maintained is one of the most important things you should pay attention to. How safe is your DIY website? It’s always a good idea to seek help from professionals that could help you in protecting your website from malicious data that could ruin your site. Websites establishes your brand and credibility which helps you reach your potential clients in giving them the service or products that they need. Having a great looking website takes you to the professional edge and could grab your readers’ interest on your content and offers. Have you decided in which of the two are you going to choose? Reach out to us today and we can help you make your ideas come to life!